Let the cookie bonanza begin! It’s about time, don’t you think, in that we’ve had an entire week to digest our turkey and stuffing and pie. Some might say an onslaught of holiday cookies is long overdue. Fair warning: we’re pretty much doing sweets for the rest of the month (maybe a few savories in there, for balance, but really, balance is for January). To get things started off right, these grain free shortbread cookies are the first of two chocolate dipped cookie recipes in a row. I didn’t do it on purpose, but I guess that goes to show where my priorities are this time of year. I’m pretty sure you’ll have no qualms about jumping on the It’s-December-Let’s-Eat-Everything-Dunked-in-Chocolate bandwagon with me once you get a taste of these shortbread. 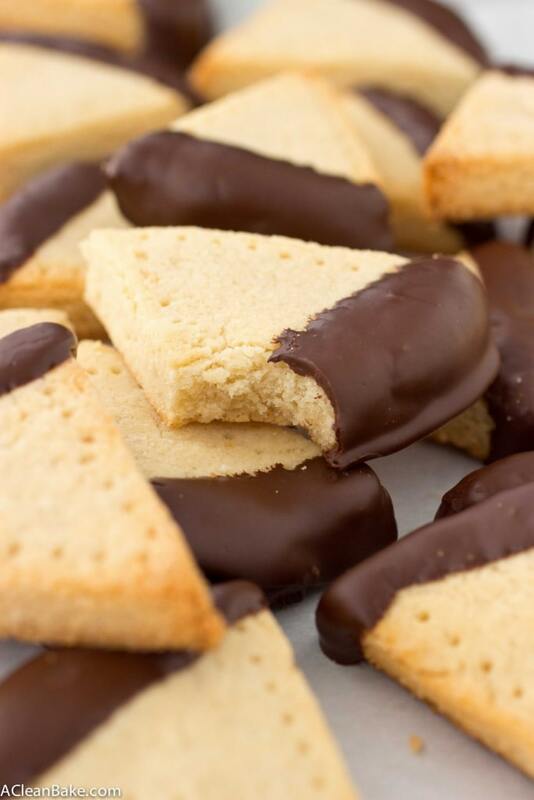 Just like a classic shortbread should be, they’re dense, buttery and very subtly sweet. They pillowy softness that characterizes almond flour-based pastries works perfectly for shortbread, but you can cook them 1-2 minutes longer than the recipe specifies if you’d like them to be a little heartier and crisper, like some store-bought shortbread. The very limited ingredient list means that each ingredient *really* counts, but take special care with the butter. I recommend using the absolute best quality unsalted butter that you can find, because the flavor will really shine through and better butters (say that 5 times fast) really do have a noticeably richer flavor. If, however, you can’t tolerate dairy, you can use coconut oil instead. Like the butter, the flavor of the coconut oil will be noticeable, so these won’t taste exactly like traditional shortbread if you use coconut oil. These definitely stand on their own, so feel free to skip the chocolate dunk if you want to, but if you want to, I might worry about you. 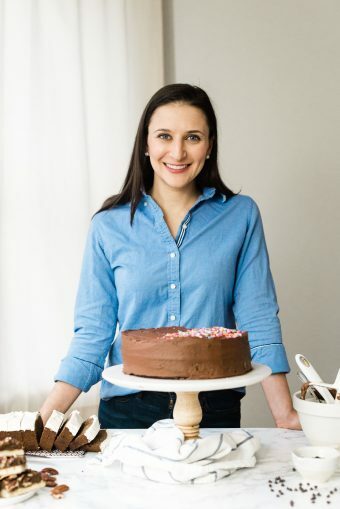 The sweet, silky touch of chocolate complements the rich, but sparse flavor of the cookie and you can use any chocolate you want: semi-sweet, dark, super dark (my personal choice), or dairy free. Oh, and if you use the homemade stuff, you’ll want to keep these in the fridge until you’re ready to serve them. So what do you think? Are these worthy of kicking off this year’s cookie bonanza? PS: Now you can see all of the holiday cookie options on this site in one place! PPS: Speaking of celebrations, this time of year is a big birthday season for my family, and today is my mom’s birthday! As the person who taught me to bake, she’s indirectly responsible for everything you see and enjoy on this site, so let’s wish her a happy birthday 🙂 Happy birthday, Mom! In a large mixing bowl, whisk together the almond flour, coconut flour, salt and sweetener. Add the egg whites and butter (which should be cool enough that you can hold your fingertip in it for 5-10 seconds without flinching) and stir until evenly combined. It sound be slightly sticky. Once the excess moisture has absorbed, divide the dough into two equal portions. Gather the first half into a tight ball, then roll or press into a disk (about 1/2" thick). Cut the disk in half, then cut each half into thirds so that you get six triangles out of the disk. 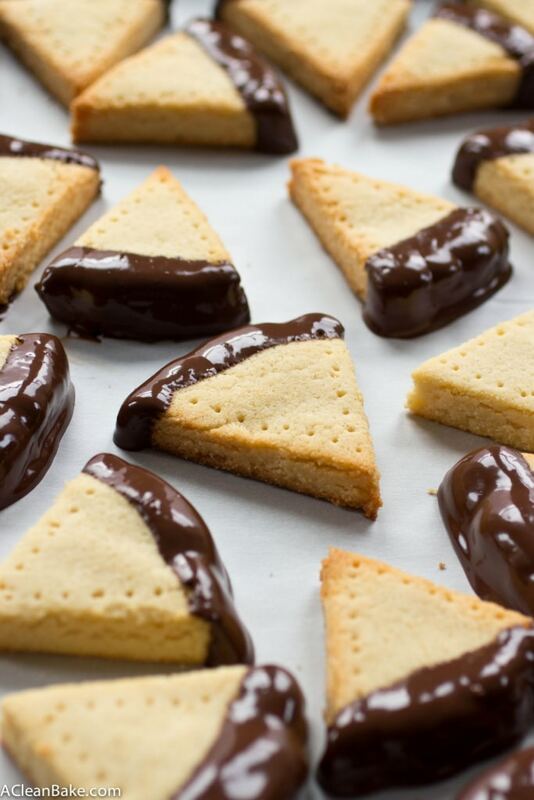 Transfer the triangles to the prepared cookie sheet, spacing them about 1" apart, then repeat the process with the remaining dough, to create another 6 cookies. Gently poke each cookie a few times with a fork, or make a decorative border with the tines. Bake for 18-20 minutes, remove from the oven and transfer cookies to a wire rack to cool completely and firm up. Prepare the dipping chocolate by melting the chocolate and coconut oil in the microwave or over a double boiler. Add the espresso powder and salt (if using), and stir until completely smooth. Grip each cooled cookie by the pointy end and swipe the wide end through the chocolate. Shake gently to remove excess chocolate, then transfer to a piece of wax or parchment paper to solidify. The butter is responsible for most of the flavor of the cookies themselves, so use the best quality you can find. If you can't tolerate dairy, omit the butter and substitute an equal amount of coconut oil. The cookies will need slightly less baking time (17-18 minutes), and will have a slightly coconutty flavor. I’m so excited, shortbread is my total fave cookie and the other day I was wondering about making a paleo version! cookie baking is definitely one of my top priorities right after I finish finals!! I can’t believe these are grain-free, they looks so pillowy and perfect, literally perfection!! Im what you would call a dunker, so I would gladly dunk one of these babies in a cup of hot coffee!! Delish! 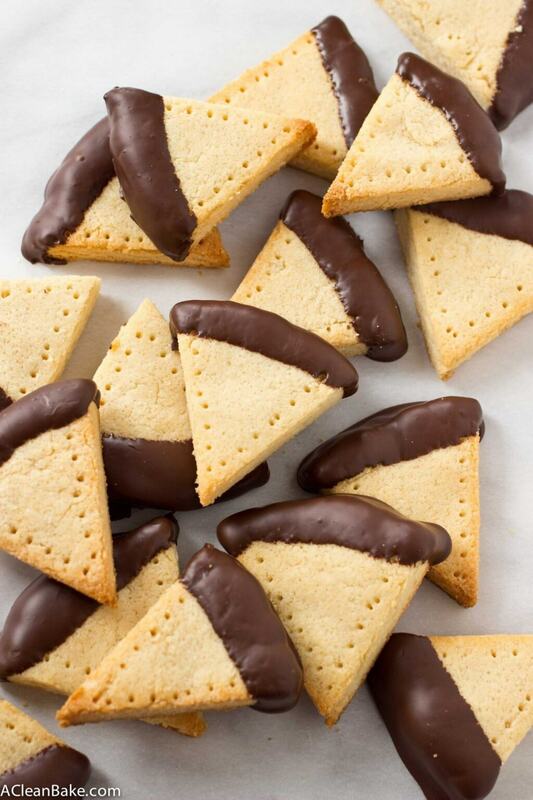 These shortbread cookies look so delicious- pinning! Yaaaaaay happy birthday to your momma!! 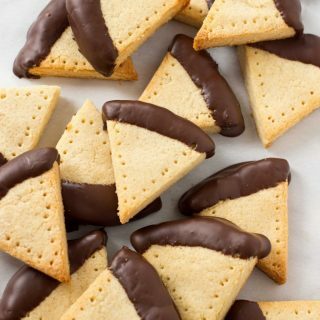 These shortbread cookies look ah-maaaay-zing! I love the chocolate addition and am all about a healthier cookie. Best.use.of.butter.evah!! Thanks, Julia!! Try ’em – you’ll love ’em! I know, right? I have had a couple taste testers call me a liar, which I totally take as a compliment! I thought as much – a classic seemed like the best way to start! Hello. Is espresso powder the same as instant coffee granules? Hi Sophie! No, espresso powder is the same idea but not the same thing. Instant coffee granules are larger and I suspect that they also have a slightly different flavor. If you don’t have espresso powder, though, you can leave it out! Nora – I made these yesterday and they are fabulous. If anyone is reading this – the quality butter is definitely ESSENTIAL! I never ended up swiping mine through chocolate because they’re so tasty as-is thanks to the butter. The only thing I had to do differently was to adjust the baking time and decrease by about 3 minutes! Thank you so much for letting me know! I am thrilled you liked them, and when someone likes a recipe enough to LEAVE OFF THE CHOCOLATE that’s really saying something 😉 Funny about the baking time, but I know these can be finicky. I bet your oven just runs a little hotter than mine, no big deal. I’m so glad they worked for you!! Planning on making these today, only I don’t have any stevia or monk-fruit sweetened sugar replacement. Could I just use regular organic sugar? Would I need to add more/less? Thank you! Love these cookies. Already finished the first batch and it’s only mid December 🙂 instead of dipping in chocolate I sprinkled edges with colored sugar. My only suggestion would be check throughout baking time as I ended up burning them a bit. I probably rolled too thin. Thanks for a great gluten free Christmas option! 2) Your oven could run hot, or you could have hot spots in your oven which cooks the cookies faster. If you are concerned, the easy and cheap remedy for both of these issues is to buy a simple oven thermometer (usually around $10 on Amazon or kitchen supply stores) so that you can monitor the oven temp throughout the baking process. Could I cut these with Christmas cookie cutters instead of into sections? I’ve never tried it, but you should be able to. The dough is a bit delicate, but if you use a cutter without a lot of small details, you should be fine!